By Ross Elliott - posted Wednesday, 17 August 2016 Sign Up for free e-mail updates! The changing economy is an irresistible force, the impacts of which are being played out on many fronts. As jobs and the nature of work change under the relentless advance of technology, so too are decisions about where workplaces should be located. Central business districts – long the glamourous headquarter preference for leading professional service firms – are under increasing pressure from competing centres. Contrary to popular belief - and no doubt to the disappointment of inner urban boosters utterly fixated on the virtues of a downtown live/work/play lifestyle to the exclusion of all else - the non-central parts of our major metropolitan regions are the ones that are growing jobs at the fastest rate. The reality of suburban dominance on housing and economic fronts is something I’ve been writing about for some years now and every time I consult fresh data, that reality is confirmed. In our major metropolitan areas, it is the suburban domain where more than 80% of jobs are and where nine out of ten people choose to live. This isn’t to deny the CBDs their premier role as the seats of government or as a central focus for community-wide cultural facilities, executive business offices and places for social interaction. But it does point to a possible imbalance in infrastructure priorities or policy attention – the bulk of which seems now to favour privileged inner city domains to the exclusion of economically larger suburban locations. The latest labour force data from the Australian Bureau of Statistics paints the evidentiary picture. 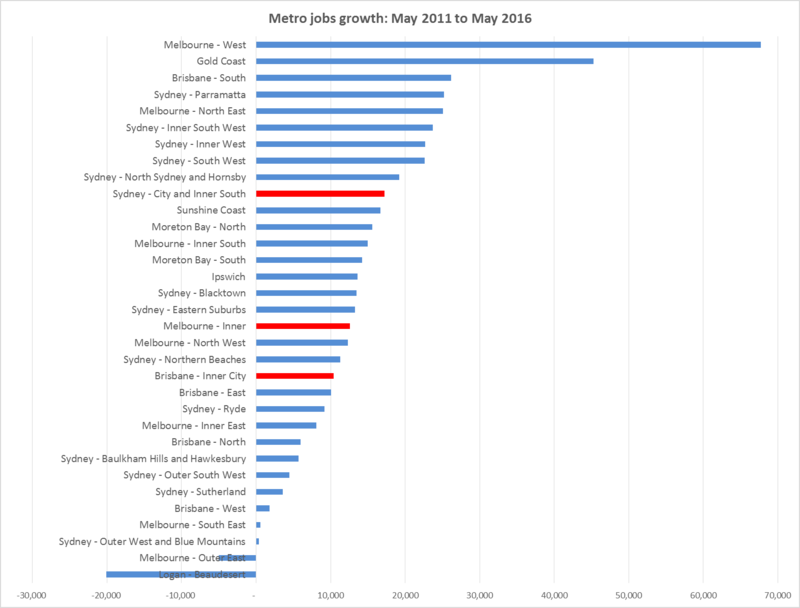 Taking in our three largest metropolitan areas, employment growth in the inner city areas over the last five years is not the dominant story some might have you believe. 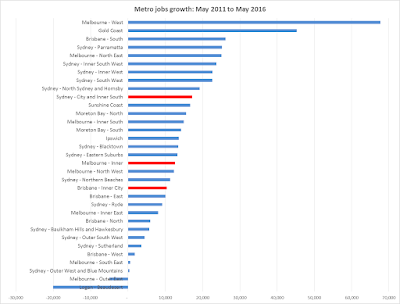 The labour force data is by SA4 level, which broadly means for metro areas something much larger than a suburb but smaller than a city. It typically combines multiple suburbs into a population group of 300,000 to 400,000. What’s immediately apparent is how many blue non-central locations are outperforming the inner city regions. Cities may well be the engine rooms of the economy but it’s evident from this data that those engines, in job terms at least, are producing more output in the suburbs. In fact, of the total 468,300 new jobs created in these three large urban areas in this five year period, 91% of them were for people created in non-central locations. 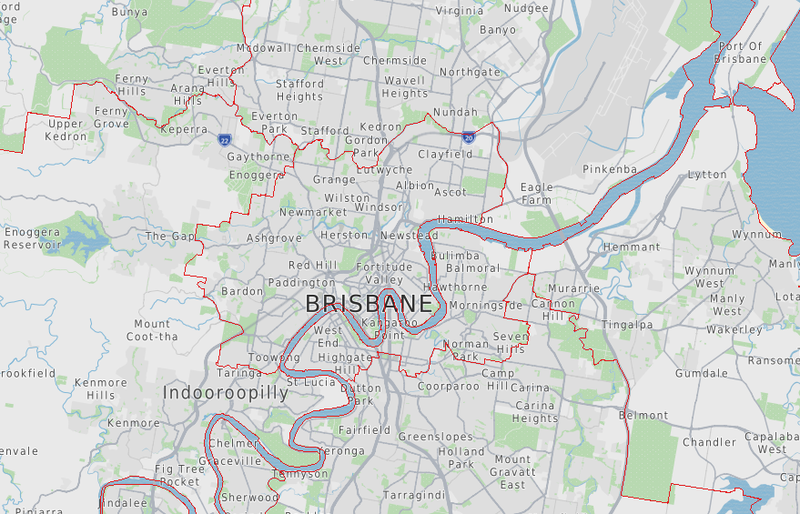 Keep in mind that this definition of inner city is much broader than just a CBD and fringe, as popular opinion and industry convention might define the inner city. 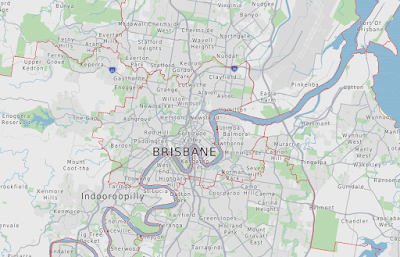 For Brisbane, its boundary stretches from Toowong to Bardon, The Grange, Clayfield and south to Seven Hills and Norman Park. This is a slightly modified version of an article first published on The Pulse.